Search for “Basic Training Bible Ministries” in your podcast software. According to Google, a podcast is “a digital audio file made available on the Internet for downloading to a computer or mobile device, typically available as a series, new installments of which can be received by subscribers automatically”. 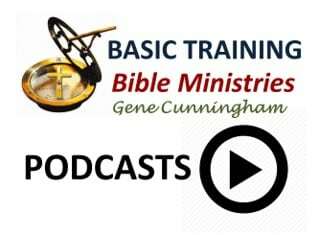 You may not know this, but you can listen to Basic Training Bible Ministries audio lessons as podcasts on your mobile device or PC. One advantage is that you can download lessons directly and listen when you don’t have internet connectivity. Another advantage is getting notified by your device as soon as new lessons are available.